· Iran's nuclear standoff: who is the loser? US War on Iran: What is the Difference Between Benjamin Netanyahu & Colin Powell? 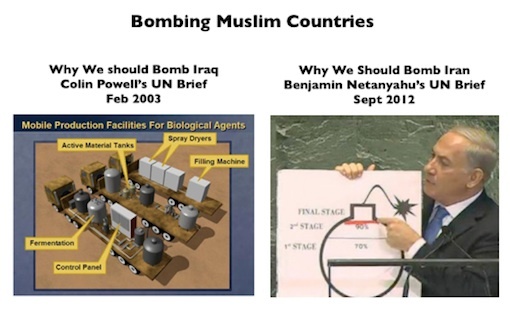 Who is the more sophisticated bullshitter when it comes to convincing the world of the pressing need to bomb a Muslim country before it attacks anyone — Colin Powell or Benjamin Netanyahu. The attached visual aid combined with the entymology of the word “sophisticated” and an analysis of the word before should enable you to answer to the question to your own satisfaction. Iran threatens no one. Western and Israeli leaders know it. So do over 100 Non-Aligned Movement countries coming to Tehran. They'll be there from August 26 - 31. They'll participate in NAM's 16th summit. Their presence endorses Iran's legitimacy, extends support, shows disapproval of Western hostility and belligerence, and confers prestige when Tehran most needs it. Washington and Israel target the Islamic Republic relentlessly. Longstanding war plans await implementation. Media scoundrels and right-wing think tanks support it. They're paid to endorse ravaging one country after another. Clawson has a point, but two years is too short. A case can be made that the war has been going on since 1979, when Iranians booted out the US-backed dictator, the Shah, and set out on a path of independent development. Just looking at the facts, it appears far more likely that the U.S. will attack Iran again than Iran would attack the U.S. or Israel, America’s Middle East pawn. I say “again” because the U.S. has already an embarrassing record of aggression against Iran, so, if past is prologue, the U.S./Israeli alliance will strike Iran, not the other way around. A review of the historical record and contemporary military outlays and actions tends to support this view. In 1953, the CIA overthrew the democratically elected government of Iranian Premier Mohammad Mossedagh, a crime for which the U.S. has never apologized. The overthrow put Mohammad-Reza Shah(king) Palevi on the throne, a man whose dictatorship savagely tortured and killed thousands of Iranians over 26 years. Seasoned U.S. analysts seem to agree with the Iranian assessment.Stephen M Walt writes in Foreign Policy, “For the life of me, I can’t figure out what the Obama administration is thinking about Iran... I’m puzzled.” Gary Sick, writing for CNN, predicts dire consequences of an attack on Iran and seems to question its wisdom. So why is Obama being so confrontational? So irrational? In 2010 the FBI invaded the homes of peace activists in several states and seized personal possessions in what the FBI–the lead orchestrator of fake "terrorist plots"–called an investigation of "activities concerning the material support of terrorism." US War on Iran: Rationalizing Idiocy: Attacking Iran For All the Right Reasons? Unlike a couple of years ago, when the consensus was split, there recently seems to be a growing consensus among pundits and certain politicians that Washington will be launching a military attack on Iran. While pundits do not have the power to make war, politicians in Congress certainly do. Furthermore, pundits convinced that this is an advisable route will do their best to bend the ears of those politicians so that there wishes can be filled, especially if those pundits are representing interests that believe they would benefit from such an attack. Why now? Part of the reason is because the majority of US troops are out of Iraq, thereby leaving a minimal number of American soldiers available for Iranian retaliation. A related reason could be the loss of prestige to Washington with the withdrawal of those troops. It’s not like Washington won its war in Iraq; it’s more like it was a stalemate with Tehran still holding on to a couple key cards. Israel, with an element of its ruling elites always ready to attack any perceived enemy, is of course a constant element in the drive to destroy Iran, as are the ruling families of certain Arab Gulf states that compete with Tehran in the oil market. Iran’s alleged support for various resistance movements in the Middle East and Asia provides Israel with but one more reason to call for war, especially since those resistance movements are primarily opposed to Israel’s expansionist anti-Palestinian policies. It is a good thing for people all over the world that Iran feels confident enough to threaten resistance to United States aggression. In the uni-polar world, that is to say one controlled by American interests, the only salvation for humanity is the ability and willingness of nations to push back against imperialism’s dictates. The signs that Iran will be a new target for the U.S. are ominous and unmistakable. The propaganda campaign against it is growing, with constant and false claims that Iran is a danger to the world and on the verge of producing nuclear weapons. While the nation's attention has been focused on the Occupy Wall Street movement, new dangers for this country and for the world have been created by the Obama administration. The president has made it clear that America's interventionist path has not changed direction one bit. If anything, he has done what once would have seemed impossible, accelerating that direction more than his predecessor ever hoped. In a period of just five months, Barack Obama has assassinated Osama bin Laden and Anwar al-Awlaki without charge or trial. He attempted to kill Libyan president Moammar Gaddafi the same weekend of the bin Laden assassination. Ronald Reagan also tried to kill Gaddafi, but gave up after one attempt and decided not to spend any effort on regime change in Libya. Obama has out Reaganed Reagan by overthrowing Gaddafi and, along with his NATO partners, waging a war against a civilian population to place a puppet government in charge in Tripoli. Once again he has succeeded in making right wing dreams come true in ways that Republicans did not dare. Who said Barack Obama would bring sobriety and dignity to U.S. foreign policy? The president’s men, and Top Woman Hillary Clinton, have thrown every stereotypical demon of middle American nightmares into the psychological operations gumbo, to create a war hysteria against Iran. No reflexive terror button is left unpushed, no racial hysteria unexploited. Bubble, bubble, boil and trouble, the administration is cooking up an almost comically infernal witches brew just in time for Halloween. Remind me why sanctions have been imposed on Iran. Is it because the country is developing nuclear weapons? If so, US and Israeli officials don’t believe it. US War on Iran: Who pays for the loss of life in Iran? Since the victory of Iran's Islamic Revolution in 1979 which toppled the U.S.-backed regime of Shah Mohammad Reza Pahlavi, Iran has been facing with devastating and agonizing financial sanctions of the United States and its European allies who didn't favor the post-revolutionary Iran's doctrine of confrontation with the superpowers and its denial of Western liberal democratic values. The 1979 revolution which put an end to 2,500 years of imperial monarchy in Iran was pivoted on theocratic and ideological values which the sumptuous, thrilling West usually tends to dislike and rebuff. Under the spiritual leadership of Imam Khomeini, Iranians declared that they wouldn't need the support of Western and Eastern superpowers, will stand on their own feet and only seek to realize a political regime which establishes its bases and principles in accordance with morality and Islamic solidarity. · Whose Bright Idea Was RussiaGate? · Will Putin Realize That Russia Holds The Cards? · Are You Ready for Nuclear War?